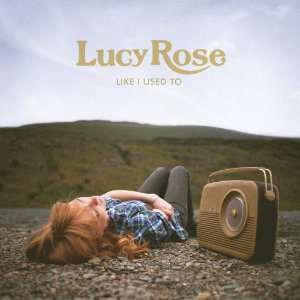 Lucy Rose’s half-decade career has been well documented. From her gold record with Bombay Bicycle Club, her extensive touring on the festival circuit and slow drip of new material over time to keep the wave of acclaim building, it’s a career that’s already reached heights that most only ever dream of. So, can she keep it up with this, her highly anticipated debut album ‘Like I Used To’? ‘Red Face’ opens with a crash before settling into her almost trademark gentile vocals and from there, you’re trapped. Deciding to listen to something else before this album has finished is a challenge, from listening to it on travels to even just lying in bed. You want to keep listening through the familiar yet fresh sounding ‘Middle of the Bed’ and continue through all eleven tracks. But it’s the two newest singles ‘Lines’ (Video of the Moment here) and ‘Bikes’ (Video of the Moment here) that steal the show. There’s a simplicity to both of them that seems to erupt into the kind of tracks that Laura Marling’s sets have been needing of late: energy. They build the kind of atmosphere that similar songwriter Ben Howard has been pushing to the top of the billing for the last year or two. And it’s the style of music that could see Rose through success beyond that of both. The comparisons in terms of overall sound to Marling are sparse, but let’s not forget that she came through Noah and the Whale to get her foot in the door. Elsewhere on the record, it’s hard to find a weak spot. Whilst some of the album tracks sound a bit too similar to make for a hugely original record (‘First’, ‘Shiver’ and ‘Night Bus’ [Watch Listen and Tell video from 2 years ago at the end of this post] are all in danger of falling into this category), it’s not that Lucy Rose is hugely different or original that makes her an interesting artist. It’s the honesty and endearing nature of her songwriting. If you heard a track like album closer ‘Be Alright’ on a Coldplay or Mumford record, you’d flush it out as overglazed “what you want to hear” music; in Lucy’s repertoire though, there’s the uplifting nature of what feels like a story we don’t know behind it and that’s almost so relatable, it’s a cliché. Luckily, by this point in the album, you’re so fond of these semi-autobiographical songs that clichés are lost to honesty, and that’s what makes this album so special. ‘Like I Used To’ is out Monday the 24th of September on Columbia. John interviewed Lucy at Reading last month; read that interview here. You can also catch Rose on tour in October and November. Update 19 September: Thanks to her lovely PR people, you can stream the album below.